Mike Delp has been making wool socks and various other products since 1997. Today together with his wife Krista Graves Delp, they make some of the most comfortable and historically great stockings and other products. We are excited to offer their products. Both their heavier weight stockings are great for year round use, and their lightweight stockings are especially great for warmer summer days. Take a look below and you will see great selection of products and colors. You can't go wrong with these great Made in the USA products. Soft and comfortable made from Merino wool, these stockings will keep you warm on those cool nights and wil breath much better than cotton stockings during the warmer summer months. Stockings fit size mens 9-13. 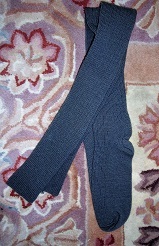 Thigh high, light weight ribbed Merino wool stockings. Fits 9-11. These Merino wool fingerless mitts are extra long going to or over one's elbow. Available in black and One Size fits most. They're very warm, yet leave your fingers free to do your busywork.